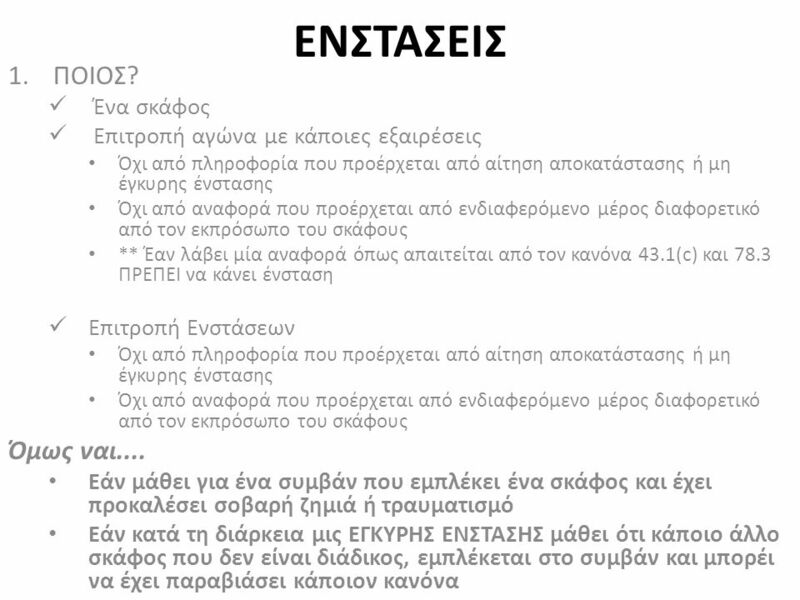 ΕΝΣΤΑΣΕΙΣ 1.ΠΟΙΟΣ?  Ένα σκάφος  Επιτροπή αγώνα με κάποιες εξαιρέσεις • Όχι από πληροφορία που προέρχεται από αίτηση αποκατάστασης ή μη έγκυρης ένστασης. 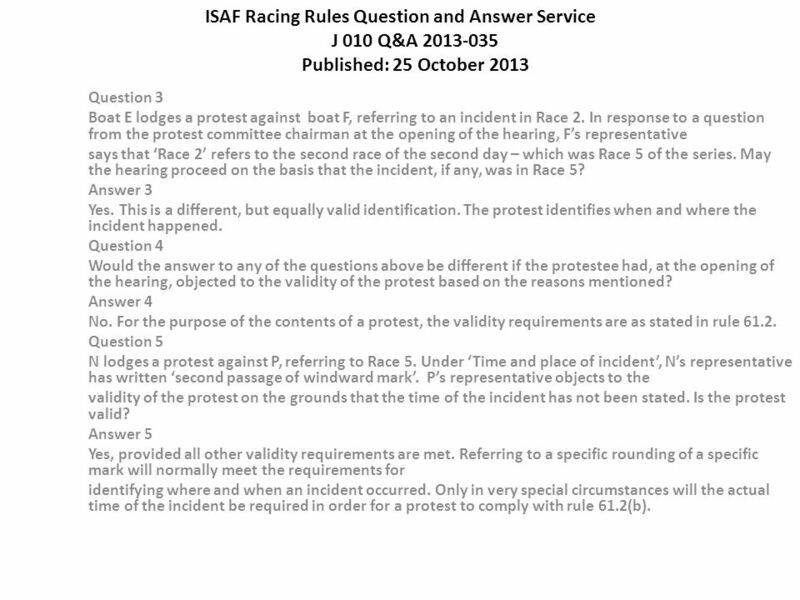 6 ISAF Racing Rules Question and Answer Service J 010 Q&A 2013-035 Published: 25 October 2013 Situations A series with 6 races are sailed over two days with 3 races each day. There are incidents in Race 5, which is sailed on the second day, and several protests are lodged within the time limit. Question1 Boat A lodges a protest against boat B, referring to an incident in Race 6. At the opening of the hearing, B’s representative does not object to the validity of the protest, but says that the incident was in Race 5 and not Race 6. On reflection, A’s representative agrees that B is correct. May the hearing proceed on the basis that the incident, if any, was in Race 5? Answer 1 No. 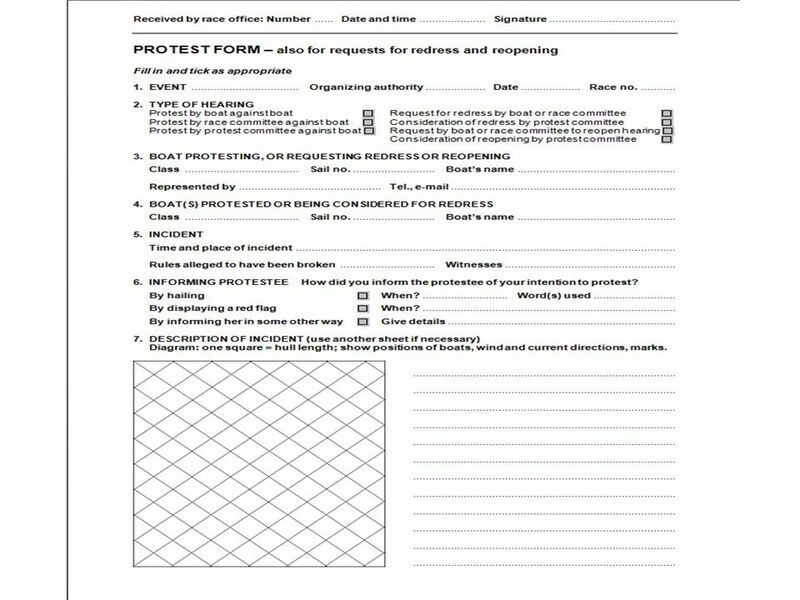 Rule 61.2(b) requires that the incident, including where and when it occurred, is identified when a protest is lodged. Question 2 Boat C lodges a protest against boat D, referring to an incident in Race 5 when Mark 1 was rounded for the first time. D’s representative does not object to the validity of the protest, but says that the incident happened when Mark 1 was passed for the second time. On reflection, C’s representative agrees that D is correct. May the hearing proceed on the basis that the incident, if any, occurred at the second rounding of the mark? Answer 2 No. See answer 1. 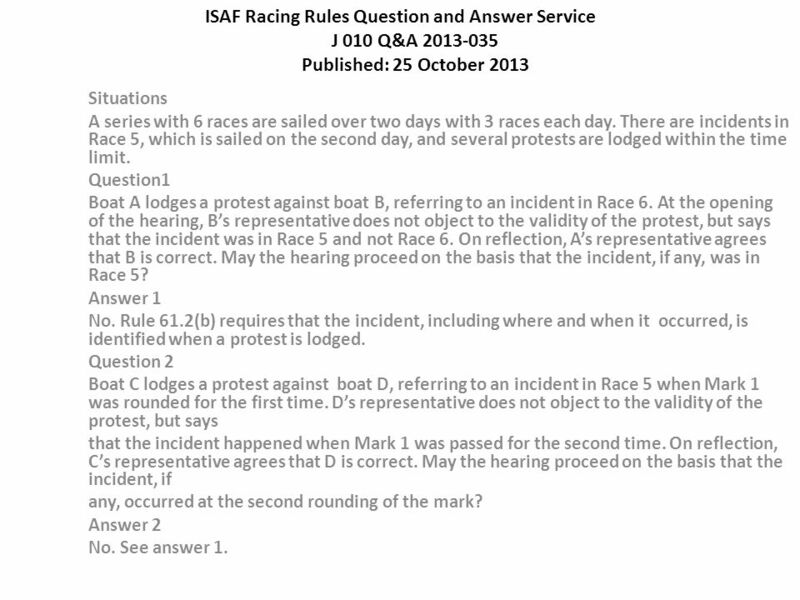 7 ISAF Racing Rules Question and Answer Service J 010 Q&A 2013-035 Published: 25 October 2013 Question 3 Boat E lodges a protest against boat F, referring to an incident in Race 2. In response to a question from the protest committee chairman at the opening of the hearing, F’s representative says that ‘Race 2’ refers to the second race of the second day – which was Race 5 of the series. May the hearing proceed on the basis that the incident, if any, was in Race 5? Answer 3 Yes. This is a different, but equally valid identification. The protest identifies when and where the incident happened. Question 4 Would the answer to any of the questions above be different if the protestee had, at the opening of the hearing, objected to the validity of the protest based on the reasons mentioned? Answer 4 No. 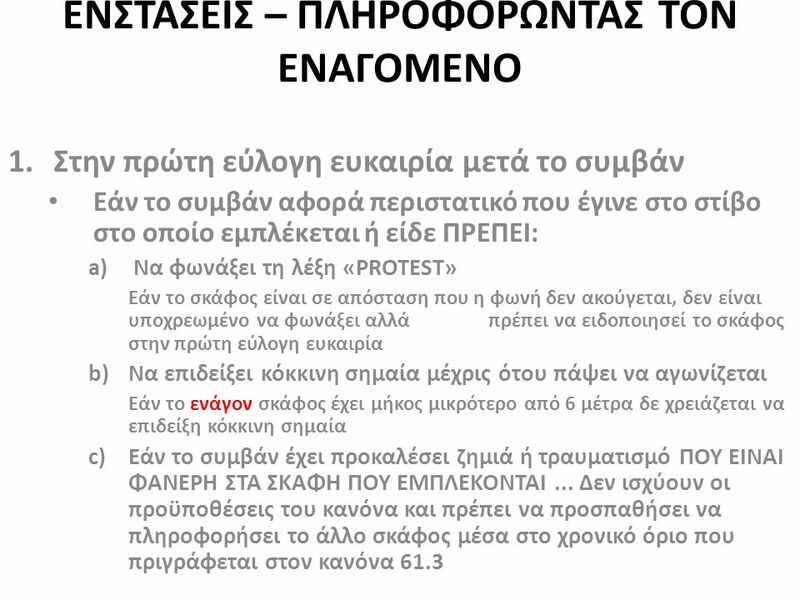 For the purpose of the contents of a protest, the validity requirements are as stated in rule 61.2. Question 5 N lodges a protest against P, referring to Race 5. Under ‘Time and place of incident’, N’s representative has written ‘second passage of windward mark’. P’s representative objects to the validity of the protest on the grounds that the time of the incident has not been stated. Is the protest valid? Answer 5 Yes, provided all other validity requirements are met. Referring to a specific rounding of a specific mark will normally meet the requirements for identifying where and when an incident occurred. Only in very special circumstances will the actual time of the incident be required in order for a protest to comply with rule 61.2(b). 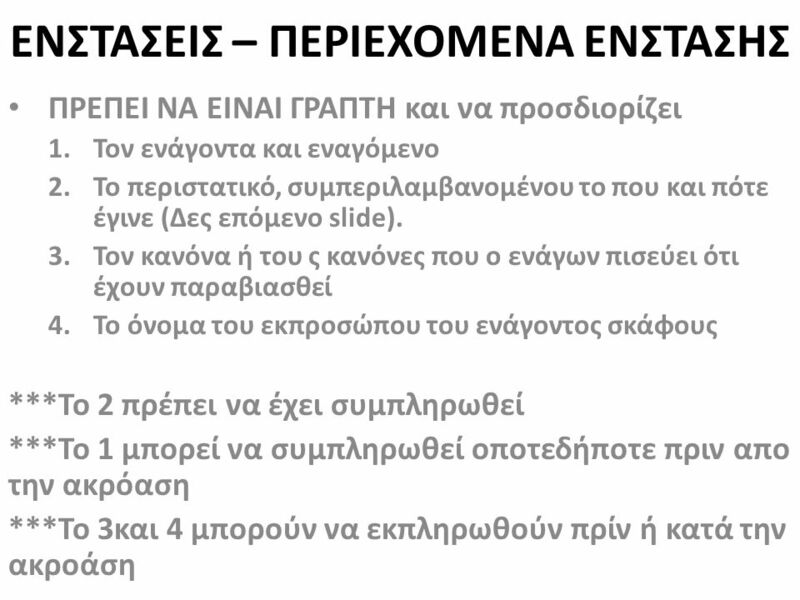 Κατέβασμα ppt "ΕΝΣΤΑΣΕΙΣ 1.ΠΟΙΟΣ?  Ένα σκάφος  Επιτροπή αγώνα με κάποιες εξαιρέσεις • Όχι από πληροφορία που προέρχεται από αίτηση αποκατάστασης ή μη έγκυρης ένστασης." Οι δύσκολοι Κανόνες Rule 62 Rule 66 Rule 69 Rule 42.
Business English Ενότητα # 9: Financial Planning Ευαγγελία Κουτσογιάννη Τμήμα Διοίκησης Επιχειρήσεων ΕΛΛΗΝΙΚΗ ΔΗΜΟΚΡΑΤΙΑ Ανώτατο Εκπαιδευτικό Ίδρυμα Πειραιά. ΠΑΝΕΠΙΣΤΗΜΙΟ ΙΩΑΝΝΙΝΩΝ ΑΝΟΙΚΤΑ ΑΚΑΔΗΜΑΪΚΑ ΜΑΘΗΜΑΤΑ Εκπαιδευτικά Προγράμματα με Χρήση Η/Υ Ι ΘΕΩΡΙΕΣ ΜΑΘΗΣΗΣ ΚΑΙ ΝΕΕΣ ΤΕΧΝΟΛΟΓΙΕΣ (Learning Theories and. ΠΑΝΕΠΙΣΤΗΜΙΟ ΙΩΑΝΝΙΝΩΝ ΑΝΟΙΚΤΑ ΑΚΑΔΗΜΑΪΚΑ ΜΑΘΗΜΑΤΑ Εισαγωγή στην Ανθρωπολογία της Τέχνης Κουλτούρα, πολιτισμός και εθνική ταυτότητα (CULTURE &I DENTITY.